Managing vibration in audio equipment is certainly the last thing people think about. Most of us (I’m one of these) just put an audio device on the shelf and listen to it. It’s the worst thing that you can do. Managing vibration greatly improve an audio rendering. Mechanical vibrations are as important as electronic. In this article I provide a solution without esoteric or expensive material like spikes, cones or special material: a very simple recipe to get the best out of the system. What will be different after? Managing vibration solves non linearity and improves sonic performance. Bass reaches a nice level, is very clean, and deep. It’s perhaps the only way to obtain extreme bass. Medium is very smooth and detailed. All metallic and aggressive aspects are cancelled. Space is very deep, everything seems so natural. Managing vibration on all your equipments can improve sound more than you can imagine! I have a top-end system, is it necessary to manage vibrations? Yes, with Top-End or conventional material, with good management, you can improve the sound probably more than you can imagine. I have audio shelves, is it necessary to manage vibrations? Having an audio shelf is a good starting point. You can do better after reading this article. I have low cost link cables; does yours solution solve non linearity? It’s not necessary to have expensive cable. Even after managing vibrations, faults introduced by poor cables can be amplified! Get medium quality audio cable before managing vibrations. I have non-tube electronics, is it necessary to manage vibrations? I take a long time to choose my equipment and like a good final result. Don’t you want to break this subtle balance and route me to standard sound? With managing vibration your system doesn’t loose its soul. Imagine your system near zero fault. I put my equipment on cones (spikes), is it necessary to manage vibrations? Cones, spikes, like special shelves, only partially solve vibration problems. Standard spikes (cones) introduce non linearity. My systems does not use cone. 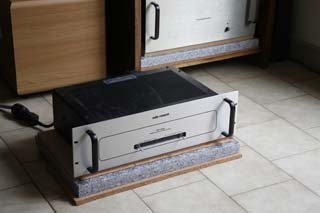 Solid state equipment is insensitive to vibration because it only carries an electronic signal. Like all audio equipment, solid state electronics are affected by vibrations. Managing vibrations (mechanical design) is as important as electronic design. 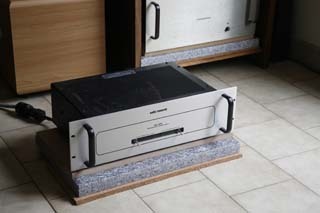 For these tests I use an Audio Research SP11 preamplifier. This two part valve preamplifier (Power supply and preamplifier) are sensitive to mechanical vibrations and have a very long power cord. It makes carrying operations easier. The first test was applied only on the power supply block. This block doesn’t contain vacuum tubes. Step one, put the device on the floor. 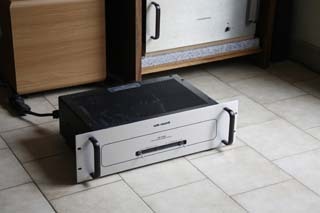 Sound is full of faults, but better than standing on a standard shelf. 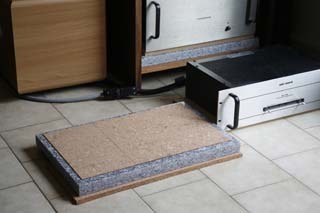 Step two, put the device on virtual Earth (granite 40mm) and isolate from vibrations with thick cork (10 mm). Granite has very high density (48cm x 30cm - 11Kg). Sound rendering: very strong and deep bass, metallic medium with coloratura (duck voice). 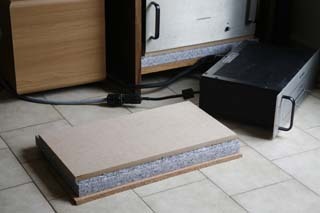 Step three, put high density wood (MDF – 16mm to 22mm) under device. Sound rendering: It smoothes metallic aspect and cancels coloratura. Step four, take off the feet. Entire device must lie on the high density wood. 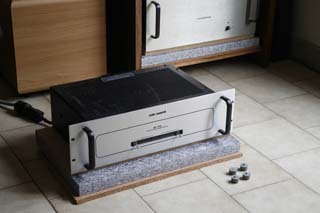 Standard feet totally degrade sound. If you can’t take the feet off, or don’t want to, you can make a hole in the high density wood to put the device's feet into. Sound rendering: At this step you reach sound that you could not imagine. Non linearity disappears, and you hear a lot of details in soft sound. 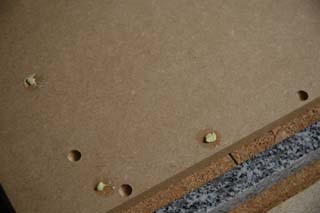 Step five, insert a thin piece of cork (1mm). Sound rendering: smoothes high frequency and rounds low frequency. WARNING: This step can enhance sound or totally degrade it! It depends on your equipment. Confirm by listening test. Step six, link all elements with ‘Patafix’. For this use ‘Patafix’ or ‘Blu Tack’. 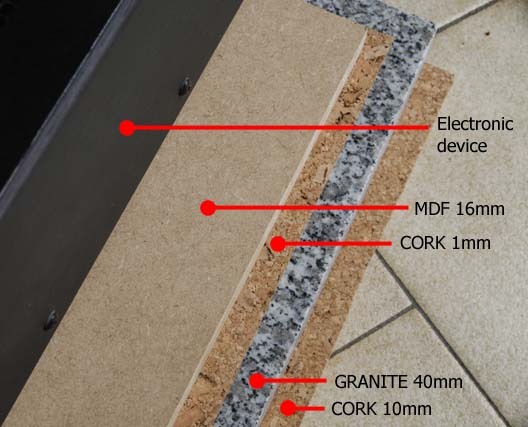 It is an easy and reversible solution to link the device to a high density wood (and high density wood to granite if you do not use thick cork). Recessed hole to insert screw. After managing vibrations you discover your system’s real sound. No equipment like modulation cable, main conditioner… could provide a better improvement. Managing vibration doesn’t improve sound, it does not degrade it. It’s the only way I know to obtain extreme bass. This method uses different materials with various frequency responses. One rigid or soft material is unable to completely manage vibrations, mixing soft and rigid is necessary. Apply these techniques on all your audio equipment to obtain best performance, don’t forget equipment like the main filter or the external power supply, everything is important. After you manage vibrations, you could easily choose and compare the modulation cables, main cables, audio accessories… The result of comparing two accessories or equipment could be totally different before and after managing vibration. This method is not the only way to manage vibration but is a good and easy starting point. After managing bottom vibration, you can manage top vibration. Putting absorber and weight onto the audio device enhances sound too. I don’t propose an easy way to do this in this article. I only know that managing vibration is not nulling it. Excess of weight on the top of audio device kills life. 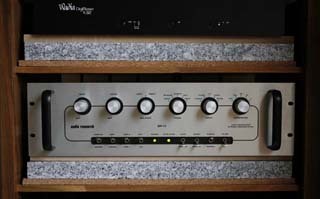 Audio Research SP11 - Power Supply. <!- Notice -> NOTICE: The information provided on these pages is intended as guide for designing audio equipments. They are free to copy and or publish. To use any information from this WEB site, please make sure to refer to title source, author name and URL Link.